Ok, that sounds a little scary, but really, it’s not! 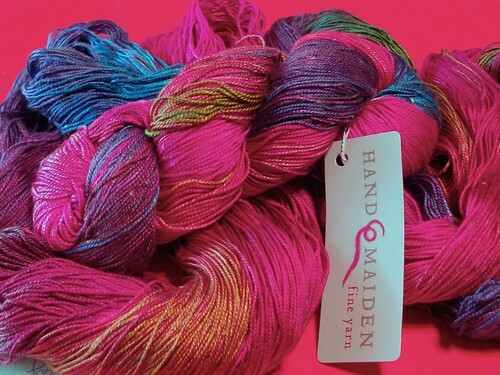 I got an email from Little Knits a couple of weeks ago about some sales, and I was looking at the HandMaiden Sea Silk. I’ve looked at it before, and have resisted, but this time I just couldn’t. This color called to me. Aside from the fact that it is just lovely and bright and beautiful, the color name just didn’t give me a choice. And no, I didn’t have a clue what I was going to do with it when I ordered it. Luckily for me, the new Winter Knitty came out just a few days after I ordered it. And in that issue? Jeanie. The perfect pattern for this yarn. I brought this with me to my regular Thursday knitting group yesterday, and everyone was petting it. 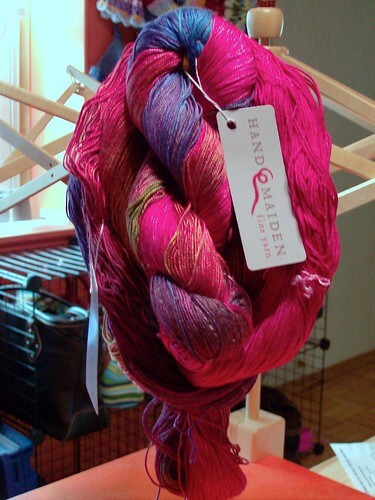 I kept it out on the table and was referring to it as my “carrot” – once I got through that (*#^$(@#*^ bind-off on Spanish Dancer, I was allowed to cast on for Jeanie. And as of last night, I finished. Of course, you’ll have to wait until it’s done drying (it’s soaking now, and I’ll block it in a bit) to see it. So, sometime this weekend. 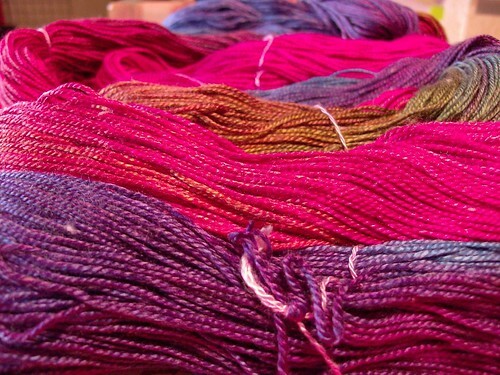 December 14th, 2007 | Tags: Knitting, Planned Projects, Yarn Acquisitions, Yarn Pr0n | Category: Misc. Beautiful color and a perfect name for you. It will make a wonderful shawl. 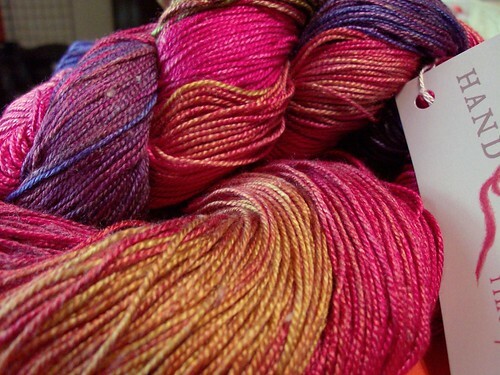 Seasilk is my “one day” yarn but damn when I got that sale notice from LK I almost caved. Can’t wait to see the spanish dancer. Ooo, so pretty! That’ll make a lovely Jeannie! My husband thinks it’s so weird that yarn can make me drool. I’m saving all the change that comes from hubby’s pocket so that I can buy some HM for Jeanie too! It’ll be a long time, but I’m starting now. Every girl needs a shawl – and Jeanie is beautiful, to be sure! She’s even more beautiful in person! As is the Espanol fringe! Purrrrr (again) for the Dragonfly!!! And YAY for Spanish Dancer – FINALLY! Congrats!!! so gorgeous! what an inspiration!